If you are a big fan of 80’s TV shows, you may want to head over to the Scottsdale auctions in Arizona this week to get a glimpse of one of TV’s most iconic vehicles: the 1984 Ferrari 308 GTS Quattrovalvole from Magnum P.I. Bonham’s, the auction house responsible for the sale, said the Ferrari 308 GTS was driven by actor and facial hair icon Tom Selleck in Magnum P.I. episodes between 1984 and 1985. After the show ended, the car was repossessed by Ferrari North America and had two owners before it was sold again in 1989. Today, the Magnum P.I. Ferrari only has 36,000 miles on the odometer – the car was primarily used for filming and promotional purposes – and is in pristine condition. It still has most of its stock parts, including its 3.0-liter 232-horsepower V8 engine and five-speed manual gearbox, and even comes with the factory tool kit. The only changes were the aftermarket Tubi exhaust and a re-dyed tan leather interior. So even if you not much a fan of Tom Selleck or his moustache, a classic relatively-untouched Ferrari should still be an enticing purchase. However, the car certainly doesn’t come cheap. Bonham estimates the Quattrovalvole will sell anywhere between $150,000 and $250,000, which is far more compared to Ferrari 308 GTS models of similar condition on the market. 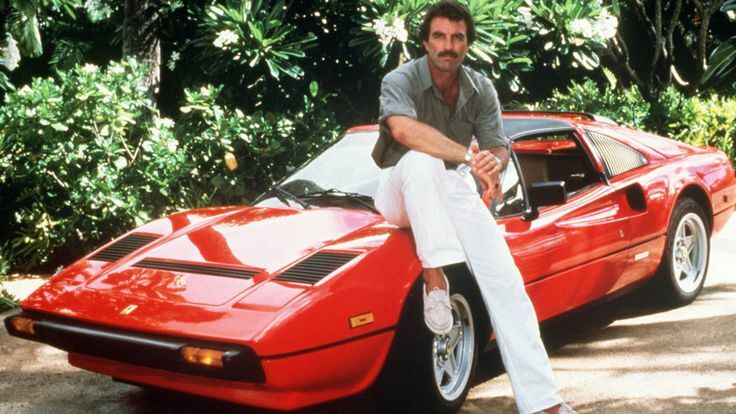 But then again, not all Ferraris were driven by Magnum himself. For more details about the car and the Bonham auction, you can check out their website here.